For the opening concert of the BAXI Early Music Season at St Mary’s Warwick on 10 October, we were delighted to have Ex Cathedra back in this glorious setting, where forces large and small have over the years given so many outstanding concerts – the group were joined for this concert by Silvana Scarinci on lute and Alex Mason on organ. Monteverdi: In Search of 1610, is one of many concerts celebrating the 450th anniversary of the birth of the great Italian composer, Claudio Monteverdi. A contemporary of Shakespeare, he is almost as important to music as the Bard was to theatre. Monteverdi’s most famous work, the Vespers of 1610, has recently been performed in Leamington and Warwick and at the BBC Proms with two performances are scheduled this Autumn in Birmingham Town Hall, among many other venues in the country. The programme that Jeffrey Skidmore devised for this concert stems from the publication in 1610 of a collection of sacred music by Monteverdi – it is the often revolutionary music leading up to it which principally inspires the “madrigals made spiritual”. 1066, 1215, 1492, 1588, 1660, 1685, 1914, 1917, 1966… Some years have a special, indelible significance in our memories. 1610 is a date ingrained in the soul of early musicians. In that year Claudio Monteverdi’s startling collection of sacred music was published in Venice. It is seen to be his first major publication in this genre, and includes a Mass, five Psalms, a Hymn, two settings of the Magnificat, an instrumental ‘prayer’, and several solo, vocal concertos for one, two and three voices. A dazzling array of techniques are displayed and, once discovered, this music captivates performers, musicologists and listeners. Where did this extraordinary music come from? Is it a revolutionary work? This programme aims to explore how Monteverdi so brilliantly arrived at his explosive fusion of styles. Of course, in music there are no revolutions, and no ‘big bangs’. All great composers are part of a heritage which is, to a greater or lesser extent, clearly identifiable and acknowledged. Although Monteverdi’s music has been described as revolutionary, in fact, he was one of several composers looking for new ways, in conventional forms, to ‘move the passions’. Opera and the madrigal were the most suitable musical structures for exploring progressive ideas and Monteverdi made unique contributions in both fields. Five books of madrigals were published in Venice before 1610, with the controversial books Four and Five appearing just after the turn of the century in 1603 and 1605. The operas L’Orfeo and L’Arianna appeared in 1607 and 1608. How were these new, experimental ideas transferred to the ultra-conservative world of church music? ‘old style’ but with remarkable invention and contrapuntal delight, occasionally creating curiously modern harmonies and effects. The other liturgical pieces in the 1610 collection make extensive and clearly audible use of plainchant, one of the oldest forms of sacred melody. So at one level the pieces were clearly part of the conservative sacred tradition. to move the passions exceedingly’. He wanted to harness the depth of this expression for the church and his skillful ‘translations’ [contrafacta] of the secular Italian originals into sacred Latin are impressive. Vowel sounds and colours, syntax, accentuation – all carefully match the originals and fit Monteverdi’s music perfectly. Coppini wrote to a friend in 1609 that, clothed with spiritual words, the madrigals might be ‘equally commendable to God and to his saints in churches and private houses.’ Three collections of madrigals ‘made spiritual’ were published in Milan in 1607, 1608 and 1609. They proved to be very popular and must surely have given Monteverdi the confidence to apply these techniques to the extraordinary ‘original’ liturgical music found in the famous 1610 collection. This is of great interest to musicologists, academics, and historians, and it also provides the basis for what was a most interesting programme. How can this amazing decade of music be presented in a meaningful way that is enjoyable, works as a programme, and also reveals Monteverdi’s creative process and exposes more of his genius? Each half of the concert began with performances of the madrigals and we then heard the sacred versions of the same pieces. These ‘contrafacta’ replaced the liturgical propers between the movements of the Mass and as the group moved, Alex Mason played organ improvisations on the ten Gombert themes. The concert ended with a performance of the second, less frequently performed six-part Magnificat – a rare treat indeed for our Warwick audience! Monteverdi’s vocal music has been widely recorded by many outstanding ensembles. A number of groups have undertaken series of recordings featuring his madrigals, including Concerto Italiano under Rinaldo Alessandrini (Aracan A425), and Les Arts Florissants with Paul Agnew – the latter’s volume of early madrigals (written during Monteverdi’s time in Cremona) winning a Gramophone Award in 2016 (Les Arts Florissants Editions AF005). The 1610 Vespers are also well represented on disc. BBC Radio 3’s Building a Library first choice is The King’s Consort’s recording for Hyperion (CDA67531/2)- which also includes the Missa ‘In illo tempore’ heard in tonight’s programme. Bach Collegium Japan’s recording on BIS (BISCD1071/1072) of the Vespers, under Masaaki Suzuki, also includes the Missa ‘In illo tempore’ and the Magnificat a 6 heard this evening. 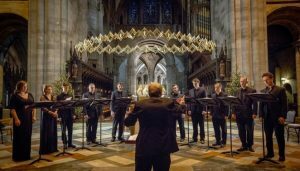 Ex Cathedra have made a huge number of outstanding recordings, including a number of recommended and award-winning performances, of a wide-ranging repertoire. Their series of recordings of Baroque vocal music from around the world has been universally well received, and discs of Gabrieli, Rameau, Lassus, and Bach are similarly impressive. More recently, their 2014 recording for Hyperion (CDA68035) with Carolyn Sampson of arias written for Marie Fel – A French Baroque Diva – received a Gramophone Award. Last year they released a disc featuring the music of Alec Roth (Hyperion CDA68144), described by Gramophone as ‘immensely attractive’.